That was one wild sell-off on Friday. Here's what caused it and why the Street may have overreacted. What happens when you combine an overall stock market decline, weak economic data, a sell-off of growth tech stocks, and worse-than-expected guidance? If you're LinkedIn (NYSE:LNKD.DL), you get a whopping 44% sell-off in the share price, apparently. Yes, in a single day more than $10 billion was erased from LinkedIn's market capitalization. It was jaw-dropping. A sudden drop like this deserves a closer look. How did LinkedIn spark such an enormous decline, and why did it made investors so skittish? 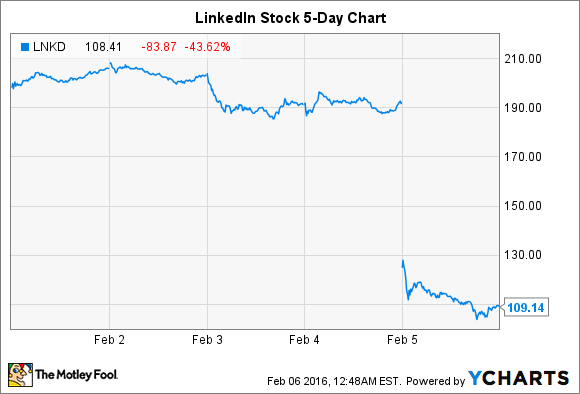 The most likely reason for LinkedIn's stock's big sell-off on Friday was its worse-than-expected guidance for the full year, reported alongside its fourth-quarter results on Thursday after the market closed. Management said it expected revenue and non-GAAP EPS in ranges of $3.6 billion to $3.65 billion and $3.05 to $3.20, respectively. This was well below analysts' average expectations for $3.91 billion in revenue and $3.67 in non-GAAP EPS in 2016. To get a better idea of why this guidance may have been a bit surprising, consider the deceleration in growth these guidance figures for 2016 implied. Asterisk for 2016 indicates the year's growth is based on management's guidance. The implied deceleration is quite the slowdown. Last year's year-over-year revenue and non-GAAP EPS growth of 35% and 41% was well ahead of management's expectations for 20% to 22% and 7% to 13% growth in 2016 for these metrics, respectively. Making matters worse, the pain of faster-than-expected deceleration in growth is compounded when a company isn't yet profitable on a GAAP basis. And slower-than-expected growth hurts even worse when GAAP losses have actually worsened recently, as has been the case for LinkedIn. On a GAAP basis, LinkedIn lost $0.06 per share in Q4, down from $0.02 in the same period a year-ago quarter; and it lost $1.29 for the full year, down from a loss of $0.13 in 2014. Investors count on growth to help scale unprofitable companies to a point they can begin reporting regular profits -- so slower growth for companies in investment mode, like LinkedIn, often means delayed profits and a riskier roadmap to profitability. There's no doubt about it: Rapid deceleration in growth when a company is investing heavily in its future heightens risk for owners. So it does make sense that the worse-than-expected guidance spooked some investors. To explain the deceleration in the company's growth, LinkedIn management pointed to a range of factors. First, management expects some weakness in its EMEA and APAC geographic segments, particularly in its field sales channel of its talent solutions segment. For the cause for this expected weakness, management cited "current global economic conditions." Management noted its core field sales business exited 2015 at approximately 30% year-over-year growth an it expects this growth to decelerate to a mid-20% growth in 2016. Field sales are important to the company, as they represent the majority of Talent Solutions revenue, which is LinkedIn's biggest segment. So any pressure in field sales is going to be accretive to LinkedIn's overall business. Second, the company is accounting for a 2% headwind from unfavorable currency comparisons. Third, guidance factors in tough comparisons for its self-serve products in talent solutions. Following a great year for this channel, management expects only single-digit percentage growth in from self-serve in talent solutions. Finally, guidance negatively reflects the removal of $50 million in potential revenue from a marketing solutions product management decided to shut down after realizing it "required more resources than anticipated to scale." Overall, there are definitely reasons for investors to be concerned. But with this conservative guidance following the company's excellent results for the fourth quarter -- boasting 34% and 54% year-over-year growth in revenue and non-GAAP EPS -- the stock's 44% one-day decline may have been a bit exaggerated. Though investors should keep a close eye on how the company actually holds up in these economic conditions throughout the year, comparing its actual results to its guidance. If rapid deceleration persists or is worse than expected, it could be a red flag.